Image: Kitamin/Shutterstock. Design: Kenzie Mastroe/SheKnows. I remember the first time I saw chef Marcus Samuelsson on an episode of Chopped and thinking he was the perfect mix of Simon Cowell and Paula Abdul on the panel of Chopped judges. He was honest and kind, but he definitely didn’t hold back when contestants needed to hear they had made a disastrous mistake. As I would soon come to find out, Samuelsson’s extensive culinary knowledge and skills are just one small part of his extraordinary career. I began to follow Samuelsson’s career as I continued down my own path in the culinary world as a food writer and editor. I quickly learned that Samuelsson is as passionate about philanthropy as he is about food — even starting his own non-profit called Three Goats Organization which is dedicated to improving the health and well-being of children, young women and families in Ethiopia by providing sustainable access to vital resources. If that isn’t impressive enough, he is also a UNICEF ambassador and works with several other organizations that support and fund humanitarian missions. I was recently lucky enough to interview chef Marcus Samuelsson for SheKnows’ series, The Fridge Files and sure, we talked a lot about food but we also got to talk about one of my other favorite celebrities — Michelle Obama. 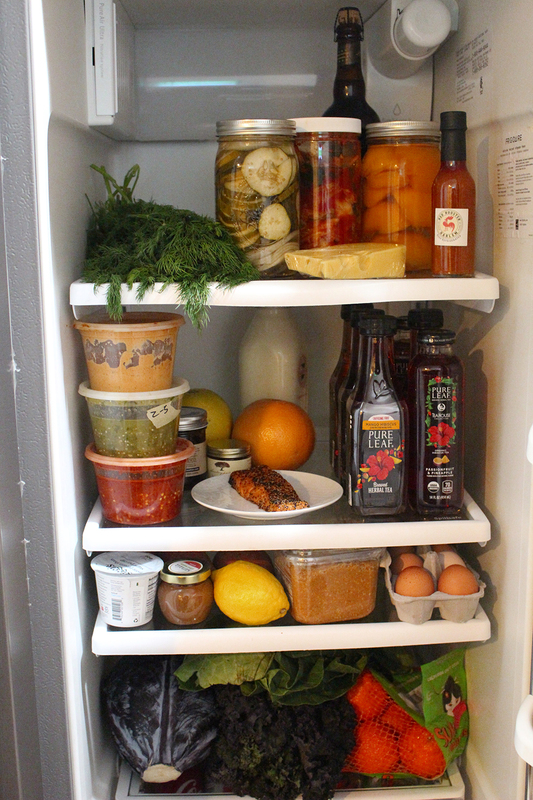 SheKnows: Can you tell us a little bit about what’s in your fridge? 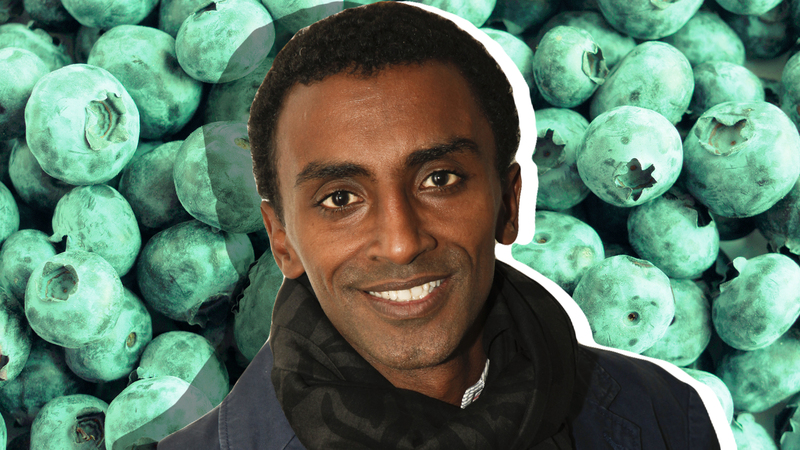 Marcus Samuelsson: Yeah. I love bringing pickles with me from wherever I travel. Whether I go to the Caribbean or whether I come back from Scandinavia, I love bringing pickles with me. Image: Courtesy of Marcus Samuelsson. SK: What a great idea. MS: It’s also great to give away gifts. I remember making pickles as a child in Sweden. So, we’ll always have some great pickles in my refrigerator. SK: Awesome. So aside from pickles, and the new Pure Leaf herbal iced teas I spotted in your fridge, what are some other items you make sure to always keep in stock? MS: You always need to have some champagne in your refrigerator. You never know who’s coming over and for what occasion. I think that’s fun. But I also like to have like a good cheese. My wife always has fermented butter. Sometimes it’s for her hair and sometimes it’s for cooking, so you better know which one is what. Things like that, we both travel a lot and bringing products like that that are very bespoke to that part of the world or that country, or that city is something to look back on when you have dinner together. SK: What would you say is your go-to healthy snack? MS: I would say, I mean, I love fruits. I grew up on things like rose hips and blueberries. And if you went out and it was cold, in Sweden you had blueberry soup before you went out. You know, super delicious. But we lived with nature, we lived near the water and woods around us, things like that. Rhubarb was something that we had a lot too. Which it’s not the season for right now but those were all things that were part of my childhood. SK: Awesome. I really want to try blueberry soup. That sounds very interesting. SK: Can you give us an example of one of your favorite or one of your typical weeknight meals? MS: Yeah, I mean weeknight it’s gotta go fast, right? I love fresh vegetables so maybe something like a ramen with carrots and cauliflower and Brussels that are charred, and maybe a poached egg. That would be something that my wife and I would enjoy to eat or some sauteed mushrooms. Especially now wintertime here on the east coast, when it’s cold you want something that is really, really nice and hearty. SK: Absolutely. So what about breakfast, what would a typical breakfast look like for you? MS: Breakfast is a luxury. I’m pretty much out the door pretty quick. It could be something like I grab a banana. Or if I’m really lucky I have some Swedish buttermilk with maybe some quick granola. But it’s very rare actually that I get a chance to sit down and have breakfast. Fifty things need to happen before I get out in the morning. SK: Haha yeah, I’m the same way. What would you consider the ultimate comfort food? MS: I think comfort food is very different for each person. I grew up in Scandinavia and I have African roots so when my wife makes a chicken stew, that’s our comfort food. I live in Harlem so something like shrimp and grits or fried chicken is comfort food there. I just learn that it’s something that you’re very familiar with. Growing up in Sweden, meatballs would be considered our comfort food. So something that can relate you back to your childhood. SK: Yeah, definitely. Are there any foods that you absolutely can’t stand? MS: No, I love food. Sometimes I love food more than I like people. I just love cooking and it’s something I’ve done all my life. SK: So you planned and executed the Obama administrations first state dinner which must have been an amazing honor. Can you tell us a little bit about what it was like to cook for the Obamas? MS: Yeah it was a lot of fun. It was obviously a big honor to do the state dinner and something that I will always remember, obviously, because we were able to cook from the garden, use ingredients from the garden. And the First Lady was much involved in the menu and setting up the menu. And it was just a great honor and something that I really enjoyed. So yeah, it was fun. SK: If you could cook a meal for any celebrity who would you cook for and what would you cook? MS: I’ve been lucky enough to cook for the Obamas, which was a great privilege. So I’d probably go back and cook for Michelle Obama again. Maybe a dish like seared scallops with bitter greens on the bottom topped with a little bit of cherries that are also infused with the Pure Leaf hibiscus cherry flavor iced tea. She loves great flavors. I’m sure she would love scallops. And I think this is light and right up her alley.